The first thing we're doing differently this year is that we've kicked our space heater to the curb (aka storage). My older child was overusing the space heater rather than just putting on more clothes. The final straw was hooking it up to our Kill A Watt electricity usage meter. After a few calculations it looked like we were spending something like $600 a year running the damn thing! I know, you don't need to tell me. Since my husband is off chemo for the next 3 - 6 months (more on that later), he's able to regulate his body temperature a bit better. So, the household temperatures don't need to be as warm. My youngest child walks around half dressed and is impervious to the cold, so that's not a concern there. I tend to be cold, but I have an arsenal of wool and down to employ. Now, before you start arguing that these seem like sultry temperatures, let me remind you that our central heating isn't exactly efficiently dispersed and the thermostat resides in the warmest part of the house. So, if it's 60 degrees in the living room, it might very well be 52 degrees in the bedroom. Or lower. I honestly prefer sleeping in a really cold room so it works out fine for me. And everyone has super cozy, snug blankets so it's not an issue. What about you? How low are you going this year? *Warning - this post contains a link to an affiliate program that might make me money, wherein I use said $ for giveaways and suchlike. Ack, the space heater! They are huge energy suckers, I put mine in the closet too. Still use it if I want a room to heat up fast (as in, people are coming over and I don't want them to freeze) but that's not often. 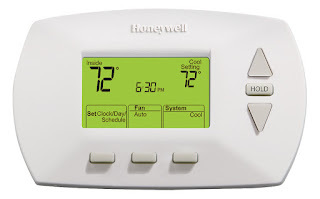 I will probably stick with my usual thermostat settings, 67 during the day and a couple degrees lower at night. Of course the bedroom is the coldest room. @Adrienne - I figured that, since our electricity rates are pretty cheap (thanks to hydroelectric) it wasn't costing us that much. Boy, was that wrong. We keep our thermostat at a toasty 62 during the day except when Dan's skin is burning off (which tends to be daily during the morning) then we crank it up to a balmy 70 and I basically have to be in my underwear. At night, we completely turn it off and bundle up under a mound of blankets on my side and one on Dan's. So that's how we do... I am looking forward to hearing how Hank is doing as you mentioned that would be in a future post. Take care. Glad to have your posts in my inbox, CC. I've moved from the middle of the U.S. East Coast to the UK since the last Freeze Yer Buns, and I've tried to carry on the tradition each winter. Since last winter, we have a new boiler, and our thermostat is in a new position. We're currently experimenting with settings for the new setup. Collard Greens Gratin. With Bacon. And Cornbread. Have Menstrual Cups Gone Mainstream?